The new model with a larger internal storage is not yet listed on the websites of e-stores, but a Mumbai-based retailer says it is available for sale. 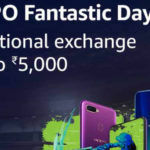 The Chinese smartphone brand Oppo had launched the mid-range smartphones Oppo F9 and Oppo F9 Pro in August, and today, on October 31, there is a new variant in India for the Oppo F9 Pro. The device was released in India with a 6GB RAM and 64GB storage, and it now comes in 128GB storage option. The more exciting news is that the larger storage model costs only a little more than the standard model. 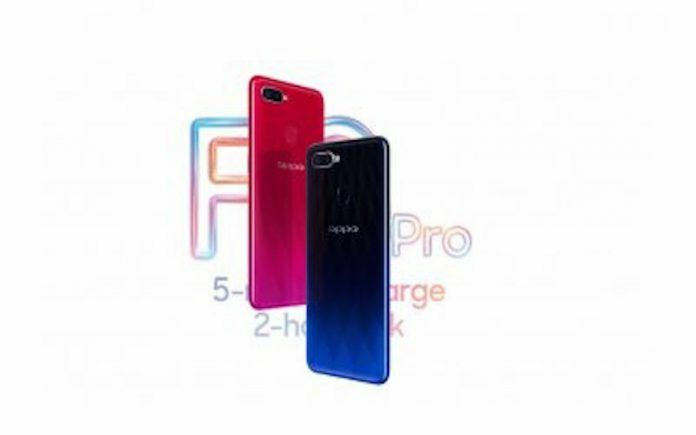 In fact, the selling price of the new 128GB model of the Oppo F9 Pro is the same as the Maximum Retail Price of the standard Oppo F9 Pro. 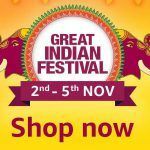 The development was shared by Mumbai-based retailer Mahesh Telecom on Twitter. Since the said retailer is usually correct in reporting smartphone-related developments, we have no grave doubts about the veracity of this claim. Smartphone brands, especially, from China, are increasingly offering large RAM and storage options for mid-range smartphones, something that was reserved for flagship models until recently. 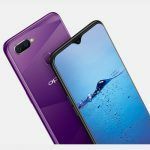 The new Oppo F9 Pro 128GB will still have a 6GB RAM, and cost INR 25,990, which is only a couple of thousand rupees more than the price of the Oppo F9 Pro 64GB. The device, otherwise, remains the same. 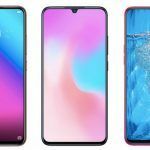 There is no official announcement about the new variant of the Oppo handset yet, neither have any e-stores listed the new 128GB model at the time of this writing. However, the process is expected to be carried out shortly. 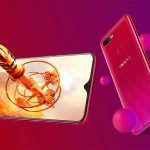 The Oppo F9 Pro is a 2018 mid-range handset with the much-hyped and well-received waterdrop notch. It comes in Starry Blue, Sunrise Red, and Twilight Blue gradient colors. The handset is a good looking device, with a glass back and diamond-cut design, a sleek body, and without any bezels but for a minimal chin. The display is 6.3 inches and Full HD type, with an IPS LCD panel and 19.5:9 aspect ratio. The pixel density of the display is 409 ppi, and protecting the screen is a Corning Gorilla Glass 6. Powering the Oppo F9 Pro is a reliable and fast Mediatek Helio P60 octa-core chipset, made from 12nm process and clocked at 2.0GHz. The chipset is paired to a 6GB RAM, and there is also a dedicated microSD card slot for adding another 256GB of storage. The front camera is 25MP, and the rear dual camera has a 16MP+2MP setup. The front camera has a wide angle lens (26mm), and the rear primary sensor has a wide f/1.8 aperture. Both cameras use large pixels. The handset ships with a decent 3500mAh battery, that is further aided by a 20W VOOC flash charging technology. The fingerprint sensor is rear-mounted, and the device holds on to the customer-favorite 3.5mm audio jack at a time when many new smartphones are doing away with it. You also get dual-band WiFi and A-GPS, but no Type-C reversible USB or Bluetooth 5.0 Low Energy. 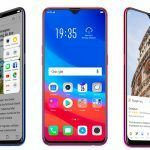 The Oppo F9 Pro is available in both offline retail stores and multiple e-commerce platforms. The device sells for INR 23,990 in its standard 64GB storage variant, and will soon be available in 128GB storage option for INR 25,990. 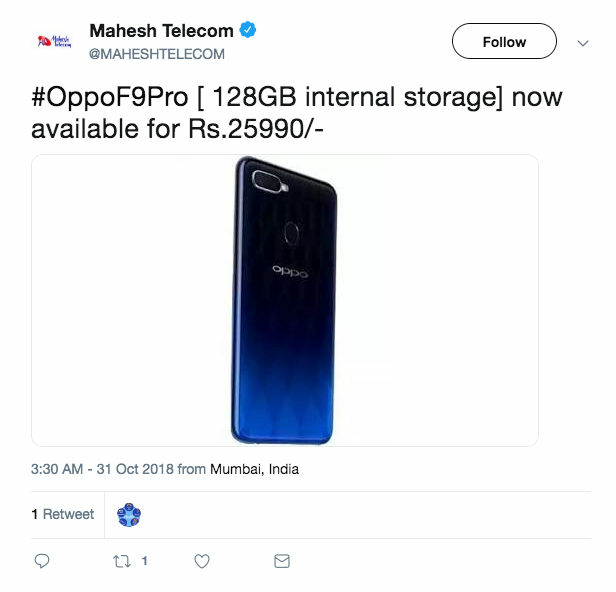 Mahesh Telecom, for its part, has tweeted that the device is already available with them, but we figure the new model will take a little while to reach all retail stores.